The Young Nonprofit Professionals Network RVA (YNPN RVA) is looking for 2019 committee members to serve on the leadership team! Joining a YNPN RVA committee is a unique and special opportunity to develop valuable leadership, strategic, and nonprofit management skills, and form strong connections to other nonprofit YPs. 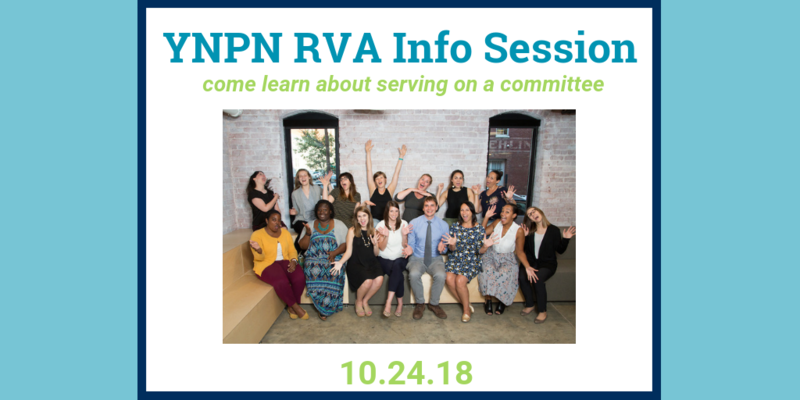 This information session will be a chance to learn more about YNPN RVA, meet our leadership team, get to know each other, chat about the volunteer roles available and have a chance to give input into 2019 programming. It’s free to attend and drinks/food will be available for purchase. YNPN RVA’s mission is to cultivate a community of future nonprofit leaders through networking and professional development opportunities that build on individual strengths and talents. We envision a rising generation of diverse, empowered, and highly engaged nonprofit leaders that will work collaboratively to strengthen our sector, and in turn, the Richmond region. RSVP: No need to register, just RSVP on Facebook to let us know you plan to be there!